Remember those dark and dreary days when you would scamper and scurry for warmth and peace of mind? This might sound familiar to those who spend their winters in the Pacific Northwest, but what I'm referring to is the broad markets before the current short-term rally we're enjoying. Today, the 10-year Treasury yield reached a five-week high as the next batches of government bonds are drawing the lowest demand in three years. That's a far cry from a few weeks ago, when investors were fleeing the stock market and blindly throwing their money into government bonds for the safe but paltry 1.40% yield. The lack of demand for Treasuries shows investors are starting to gain more confidence in the markets and once again are warming to the plethora of undervalued assets still available. The current spending increase has buoyed the S&P 500 (INDEX: ^GSPC) 2.75% over the past five trading days. 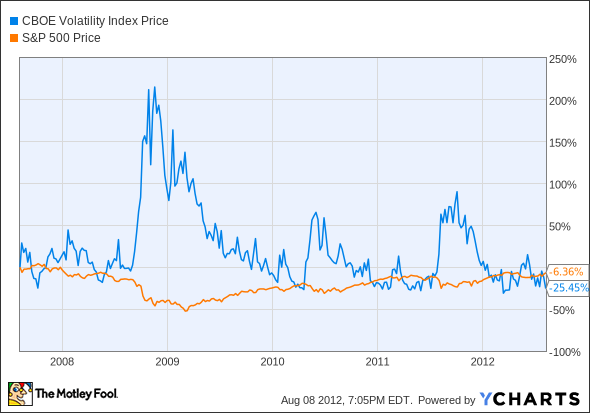 The calm that has come over the markets can also be measured using the S&P 500 Volatility Index. Today the index reached 15.32, 68% less than this time last year. The general consensus is that a VIX above 30 indicates extreme volatility and a number under 20 corresponds to a calm and complacent market. The chart above shows the Volatility Index as well as the S&P 500 over the past five years, and the general trend is that increased volatility causes short term downturns in the market. With confidence building in the market, let's take a look at a few components from the Dow Jones (INDEX: ^DJI) to see who rewarded investors today. The top Dow blue chip was Hewlett-Packard (NYS: HPQ) , gaining 2.33%. HP said it will write down $8 billion of its services business unit, creating a huge obstacle for the company as it approaches its quarterly earnings release date. However, investors didn't go scurrying after this announcement, because management still expects to meet its forecasts even with this substantial write-off. Also grabbing the bull by the horns was ExxonMobil (NYS: XOM) , with a sturdy 0.41% gain. The oil and gas giant is slowly adding value, up 5.4% over the past month, as its offsets losses from its huge natural gas arm with increases in both domestic WTI and international Brent crude price advances. The tailwinds helping crude oil prices advance are the same that boosted Alcoa (NYS: AA) 2.33% today. The increasing sentiment is being driven by expectations of a global economic turnaround, meaning investors are hoping global GDP growth increases, with consumers using more energy and consuming more materials. Alcoa is the world's largest supplier of aluminum; it usually is the first to get dumped when recessionary fears arise and rises when sentiment is strong. With more investors returning to the markets, now is a great time to use this momentum and ride the wave on the backs of proven and sturdy companies that will bring long-term gains to your portfolio. The goal is to find businesses that will help build your nest egg for when the right time arrives, not stocks that can be manipulated for near-term gains. For this reason, our analysts have selected 3 Stocks That Will Help You Retire Rich!This report is absolutely free, but you need to get your detailed report now, because it won't be available much longer. The article Fearless Investors Keep the Rally Alive originally appeared on Fool.com. Joel South and The Motley Fool own shares of ExxonMobil. We Fools don't all hold the same opinions, but we all believe thatconsidering a diverse range of insightsmakes us better investors. Try any of our Foolish newsletter servicesfree for 30 days. The Motley Fool has adisclosure policy.